As the wife of the editor I see all the books that come in for review – and I get to cherry pick the ones I want to review. When I saw this title, and its author, I knew it would be well worth my while. Thank you, Michael, for your dedication to Jerry Brunetti — “You walked the walk with cows and herbs in the rolling hills of Pennsylvania. Your green insights and cheerful tenacity will long be appreciated. Godspeed brother.” Jerry Brunetti became a good friend and colleague of mine. His far-reaching vision, and his insights regarding soil, animal and human health have informed much of what NOFA/Mass does today. Phillips has a playful, poetic style, and he anthropomorphizes soil micro-organisms. At times I found this style confusing, but in large part I enjoyed his light touch. He succeeds in disseminating complex scientific information in a manner that kept me attentive and often chuckling. Take, for example, his first sentence: “Mycorrhizal fungi have been waiting a long time for people to catch on.” It turns our usual interaction with soil on its head. I have walked away from this book with my thinking inherently changed; I can’t walk anywhere now without considering the ones under our feet who really run the show — if we let them. I look forward to this spring, to work with the mycorrhizal fungi and all the others living down there. Chapter 1 explains how mycorrhizae work. In short, mycorrhizal fungi are the ticket to healthy plants. As Phillips puts it, “The fineness of hyphae in comparison to the relative blunt hairs on feeder roots reveals how mycorrhizal fungi can access diverse nutrient niches.” He presents a long list of symbiotic benefits to plants, including increasing surface area of nutrient uptake, unlocking phosphorous for plants, acquiring nitrogen from organic matter, improving uptake of trace minerals, and enhancing nutrient density of crops. In seedlings, these fungi prevent damping off disease, reduce transplant shock and support root initiation with cuttings. In field and forest they stabilize soil aggregates, sequester carbon, improve plant growth and yield, deliver moisture as needed, augment deeper root penetration, and suppress root pathogens. Practically speaking, they mediate heavy metal toxicity, help plants deal with soil salinity, break up subsoil compaction, suppress non-mycorrhizal weeds, cut fertilizer requirements and improve tolerance of high soil temperatures. They improve photosynthesis, provide a co-factor role in protein synthesis, reserve energy and stimulate induced systemic resistance. Finally, mycorrhizal fungi are networkers that ensure balanced nutrient uptake, healthy forest succession, facilitate plant to plant communication and are the foundation for ecosystem resiliency. Mycorrhizal fungi come in a variety of formats, from tree-oriented ectomycorrhizal fungi on one end, and arbuscular mycorrhizal fungi – often associated with vegetables – on the other end of the spectrum. Mycorrhizal fungi can be “ecto” or “endo”, developing on the outside of plant roots or within the walls of the root. Soil microbiologists count some 150 species of arbuscular mycorrhizal fungi that colonize the roots of plants, all with specific roles to play in nutrient and water transport. Fungal hyphae systems are capable of fusing together. This facility to build bridges of a common mycorrhizal network can literally link the roots of all plants at a site. As a grower seeking best practices for keeping the mycorrhizal community strong all year long, I found it useful to learn that “endo” species will stay alive in plant roots for a period of time, whereas the “ectos” die off more quickly, with nothing to eat when there is no photosynthesis. I gave up pulling plant roots a couple of years ago, and, newly re-affirmed, will continue this practice. In Chapter 2, Healthy Plant Metabolism is discussed. Phillips establishes a first principle, namely that pests and pathogens are symptoms of a breakdown of natural systems. His antidote to this is healthy plant management, involving complete metabolism pivoting on mineral availability and mycorrhizal collaboration. Or, as he labels it, “Vibrancy, Vitality, Joie de vivre.” In this chapter he discusses photosynthetic efficiency, protein synthesis, co-factors of plant enzymes, fat energy and biological reserves. I recognized a lot of the work of John Kempf in this chapter. I underlined this statement as an important farmer take-away – “…when plants begin absorbing the greater portion of their nutrition as microbial metabolites, the ‘energy efficiency quotient’ of biosynthesis goes through the roof…” In other words, I must put my energy into providing the workspace for the microbial underground to work as efficiently and effectively as possible. Foliar feeding is discussed as a way to keep track of the arboreal colonization that goes on above ground, and to design your foliars with the health of these microbial friends in mind. He goes on to discuss systemic acquired resistance (SAR) and induced systemic resistance (ISR), two forms of resistance whereby plant defenses are preconditioned by prior infection or treatment that results in resistance against subsequent challenge by a pathogen or parasite. This chapter ends with discussion of those wonderful Plant Secondary Metabolites that bring the extra flavor, aroma, vibrant color and disease resistance that comes with maximum plant health. Underground Economy comes next. As Henry David Thoreau wrote, “Heaven is under our feet as well as over our heads.” This is the stuff that really excites me these days. I never did put much thought into roots and what they were up to until recently. Roots come in contact with nutrients in three different ways. The first is through direct interception — primarily Ca, Mg, Zn, Mn — with the help of organic acids, chelates and bacteria on the scene. Mass flow occurs when nutrients are delivered via water movement in the soil, which shuts down during drought. Minerals that are delivered this way include Ca, Mg, Cu, B, Mn and Mo. Diffusion delivers nutrients by means of a concentration gradient for P, K and Fe. But enter a healthy microbial community and roots will get 80-90% of their underground mineral nutrition through their relationship with the soil food web. The main course is organic matter created by plants through photosynthesis and is managed in large part by bacteria in collaboration with fungi. The second trophic level (each of several hierarchical levels in an ecosystem, comprising organisms that share the same function in the food chain and the same nutritional relationship to the primary sources of energy) is comprised of decomposers, mutualists, pathogens and parasites. The third includes shredders, predators and grazers. The whole family of bacteria, fungi, nematodes, protozoa, along with higher level predators like roly polys, spiders, millipedes, centipedes, spiders, earthworms and ground beetles are involved in the decomposition process. I think it is somewhat important to understand the four families of fungi. I learned just recently, for example, that the white mold on the surface of my wood chip compost on the garden beds is a saprophytic fungi. These are the decomposers. The mutualists are the mycorrhizals that form the relationships with the plant roots. Pathogens we all know about and parasites can be working for “good or ill” from the human perspective. For the true student of fungi and their roles, Phillips goes into somewhat greater detail about the dual roles of saprophytic fungi in living and dead plant breakdown. Plants get 95 percent of their nutrition from air and water – carbon, hydrogen and oxygen. Roots work best to get the remaining 5% of their nutrition when in collaboration with mycorrhizal fungi. Photosynthetic rates determine the amount of ready carbon that roots have to trade with the fungi. Phillips postulates that the effectiveness of any one plant will be improved in its connection to the other plants in the soil due to the intricate hyphal networks that provide a balanced array of mineral nutrition to all the plants as long as their needs are met through optimum photosynthesis. Hyphal pipelines move nutrients from areas where resources are high to areas where resources are low. The bottom line is that everyone is working together. 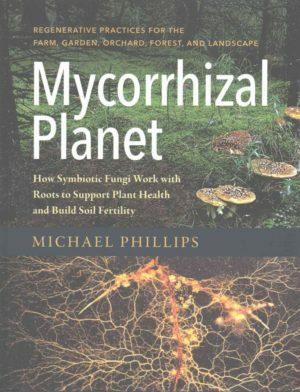 Michael’s list of suggestions for those who would honor their mycorrhizal fungi are enumerated here. “Whatever you are doing now you can undoubtedly do better” says he. Fungicides, herbicides and insecticides no longer have a place in agriculture. Synthetic nitrogen fertilizers are directly tied to the decline of soil carbon. Tillage reduces the efficacy of mycorrhizae by disrupting the extraradical hyphal network. Conventional monoculture needs to be seriously reconsidered. Animal husbandry needs to be an integral part of long range fertility strategy on diversified farms once again. Farm consolidation to the detriment of vital rural communities was a big mistake. The mad destruction of forests worldwide needs to stop. The remainder of the book is about practical ways to support the mycorrhizal world as a farmer or any type of land steward. Addition of the use of fermented plant extracts to fungal products for use in inoculating seeds is covered. As he is an orchardist first and foremost, he goes into great detail about the best timing and methodologies for mycorrhizal “accrual” in the orchard. There are some good tips for gardeners too. My main take-away in that realm was to be more generous to the perennial plants in my otherwise annual system. I plan to add at least one bed of flowering perennials in each of our approximately 1/2 acre pieces of vegetable growing area. These can be cut and sold for flowers or medicinal herbs and also provide pollinator and beneficial habitat above ground, as well as a permanent root system underground. We have moved to no-till on our farm, which opens up a lot of opportunities for mixing and matching in a previously traditionally annual system. In addition, I learned about the timing on the root flush in apple trees, which happens in spring after blossom time as well as by the end of August, when terminal buds on shoots actively stop growing. Considering that fungal growth will accelerate at this time, he suggests that cutting the grass under trees right after fruit set will provide the fungi the extra carbon needed to thrive. He is strong on lipid-based food sources for fruit trees, and prefers fish hydrolysate and neem oil in foliar applications. Michael ends the book with short sections on edible mycorrhizal mushrooms, animal culture, cover crop cocktails and finally a Soil Redemption Song. “Perhaps the real gift of the fungi and the plants isn’t the ‘carbon solution’ as much as it is showing us a way forward. That to cooperate is to find bounty for all involved… Beneath our feet is the teaching and the blessing.” That message makes me smile, and also makes me think about how I can support the mycorrhizal fungi in doing what they do best. As above, so below – because cooperation in my daily life is just as important above ground. Michael Phillips will be running an all-day seminar at the 2017 NOFA Summer Conference on Friday, August 11 followed by the evening’s keynote address (www.nofasummerconference.org).